This is the plant room at a hospice in Loughborough. 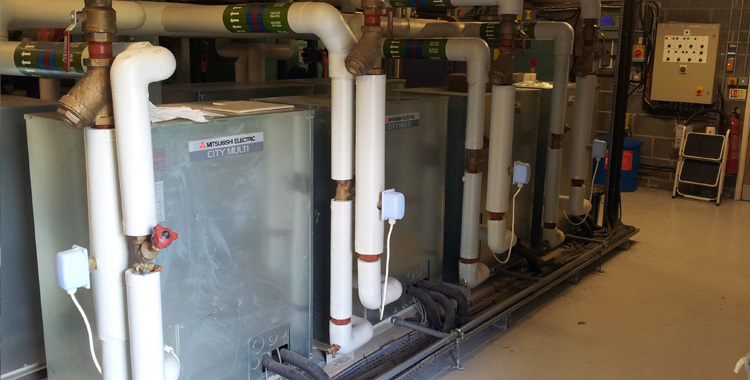 We installed these Mitsubishi VRF systems, similar to this hotel, but they are water cooled / heated outdoor units. Any heat recovered from this was put through another system which helped to heat the hot water in the building., making it a really energy efficient system. RJD Air Conditioning Services Ltd.
We are a family-run business, drawing upon over 30 years of experience within our team to provide a professional and friendly service: from the initial planning stage, throughout the efficient installation, and especially during our continued maintenance of your new air conditioning system. We pride ourselves on being able to rise to any challenge, meeting all the air conditioning needs of our many happy clients, whether they are smaller, domestic clients, looking for an installation in their home, or larger commercial ones, like hotels and hospices. We have been successfully applying this approach, throughout the whole of the UK for over a decade - we celebrated our 10 year anniversary in 2015 - and we are accredited by both Refcom and CSCS, so you can be sure that you're in safe hands. Our approved environmental contractor, Compliance (Air and Water) Ltd., offer health & safety consultancy services for Legionella control , LEV Testing and ventilation hygiene, appropriate for all of our commercial customers.